As a child Nolan heard stories from his grandfather who was a policeman in north-eastern Victoria and involved in tracking Kelly and his gang. Nolan was also familiar with the landscape of ‘Kelly Country’ from visiting relatives who lived in the area and having grown up in Melbourne, he had no doubt seen an example of the startling hand-forged armour fashioned from pieces of farm machinery which was on public display. The first studies depicting Ned Kelly date to early 1945 and later that year Nolan and Max Harris, a poet and co-editor of the Angry Penguins journal, travelled together to the site of the Kelly Gang’s last stand at Glenrowan, as well as to other key places in the story. This trip was part of Nolan’s research – a characteristic aspect of his working process when embarking on a new series – in which he immersed himself in the history, reading everything he could on the subject and even sought out Kelly’s younger surviving brother. Paintings from the second series are represented in numerous important public and private collections in Australia including: Kelly Crossing the Bridge, 1955 (National Gallery of Australia, Canberra), Ned Kelly, 1955 and Kelly, 1956 (Art Gallery of New South Wales, Sydney), Kelly with Horse, 1955 (National Gallery of Victoria, Melbourne) and After Glenrowan Siege no. 2, 1956 (TarraWarra Museum of Art Collection, Victoria). 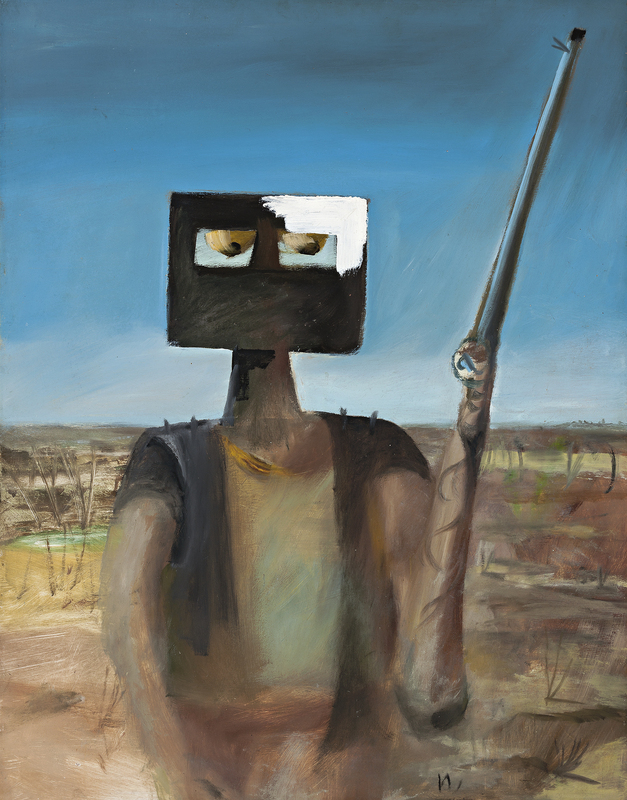 Ned Kelly – Outlaw, 1955 was probably included in the Redfern exhibition under the title Portrait of a Bushranger. Centrally placed in the foreground of the picture, the defiant bushranger dominates the composition and while his black mask rises like an ominous sentinel, the strange bulbous eyes are cast down in an attitude of self-reflection. Strangely Nolan has depicted the rifle – a surreal extension of Kelly’s arm – with both the sight and trigger on the same side, something that would have rendered it impossible to use. Possibly nothing more than artistic licence, this detail might also reflect Nolan’s identification with the heroic outsider and his tendency to romanticise the story. The primary focus of the painting however is Kelly in the landscape. Nolan has lined up the figure’s shoulders with the horizon and the torso is painted in the same muted colours and soft brushstrokes as the flat and featureless country beyond so that Kelly becomes the landscape. As an image of a man at ease in his environment, this is a concise depiction of Kelly and also perhaps of Nolan at the time. 2. Of the 27 paintings that comprise the first Kelly series, the exception to this is First-class Marksman, 1946 (Art Gallery of New South Wales) that was painted at Stonygrad, the Warrandyte home of Danila Vassilieff. See Pearce, B., ‘Nolan’s Parallel Universe’ in Pearce, B. (ed. ), Sidney Nolan, exhibition catalogue, Art Gallery of New South Wales, Sydney, 2008, p. 35 Sunday Reed gifted the paintings made at Heide to the Australian National Gallery in 1977 and they are now on permanent display at the National Gallery of Australia, Canberra.